This year’s Brrr Rabbit race out of Coyote Point Yacht Club was such a crazy mixture of hopefulness, frustration and relaxation. Thank you to those who made it out, and a “shame on you” to those who did not! It was a lovely California winter day out on the water. The day started off with the brand new Regatta Chair (yours truly) rolling out of bed and checking windandtides.com to find that the December 31st forecast of 5 knots had changed to 10 knots. Excellent! There must be some weather action going on for the meteorologist powers that be to make those kinds of adjustments! When I pulled up to Coyote Point with my bags of snacks for after the race, there were beautiful wind lines streaking across the water and a just a touch of breeze kissing my cheek. I promptly unloaded the snacks and got to work making bloody mary mix for the after-race event. The sailors started showing up early – some helping Carly to clean up the joint from the New Year’s Eve festivities, and the others just clustering around the bar waiting to start 2014 off right. Two lovely surprises met us early on – Torin Knorr decided to grace us with his presence after being absent since the hotly contested Jerry O’Grady of 2013, and Craig Thorson decided to blow off work to take Charlie out for a spin. Despite a bit of cajoling, Mark Green (otherwise known as “Tactician” by the dogtag on his keychain – ask to hear this story if you haven’t already) chose not to take Sweet Grapes out and we had a rather good, but still single digit, turnout of nine boats for the first race of the year. Regardless, the course was set for: Rabbit Start, round Z to starboard, round 8 to starboard, round Z to port, and then take your time at the outer channel markers. The crazy tides that absentee Mark Bettis felt the need to inform all the other sailors of via email dictated that we should all be back in before 4pm. Obviously no one else checks the tide charts beforehand, so good save! By 12:30pm, most of the nine boats were puttering around on the Bay. The light breeze was perfect for the Liquid Kitty with her whopping 2400lbs and still-fresh-ish bottom, and Jack Verducci already had his spinny up on Vita e Bella to either test it or his crew. Torin, who had graciously offered to be the Rabbit as the founder of this race, made his way out of the channel around 12:40pm, and then kept heading out. Vince, who had already had enough of two pre-teens on Chai DM with him within an hour asked if this was a sign of postponement. After some urging to use his motor to head back into the harbor (and a headsail change – hey, if you have a Code Zero, use it), Torin and Larry Weinhoff went in and came back out to start the race. As would be expected, Luther Izmirian was the first to cross Jet Lag’s transom, and then off he went on Paradigm all by his lonesome, in a random direction. Others who expected Torin to turn north to head for Z (he did not) had to sail south for a bit to actually, technically cross his transom before turning around to head toward the first mark. As it turns out, Torin had the right idea of heading to the middle of the Bay to catch the max ebb of 2.7 knots. While Torin was just being smart, both Liquid Kitty and Chai DM were finding joy in thwarting Jim Manishin and crew on Liquid Asset by making them duck two times in a row to work around our starboard tacks. And that was about the extent of the action that I could see for the Coyote Point racers for the rest of the day. Winds shifted in the wrong direction so that every two minutes after falling off, you were pinching – headed in the wrong direction. Spinnakers went up (which is actually a success story when it comes to Liquid Kitty with Aaron Swerkes and I) and promptly drooped. Wind lines disappeared and the Bay became glassy. Around 2:15pm, our illustrious Regatta Chair got on the radio (on the channel she had only happened to tell half of the boats to tune into) that she was shortening the course to Z, 8 and in. (Thank you, Vince and Jim for having your radios on and accessible!) Around 3pm, she (me, whatever) changed the course to Z and in (shortest course EVER). Around 3:30pm, Jack furled all his sails and said through non-verbal boat-language that Vita e Bella had had it and was headed in so that she would not get stuck in the mud during the impending minus tide. Paradigm and Charlie were quick to follow suit, and within 15 minutes, NO ONE had made it to the first mark and everyone was headed in. In short, EVERYONE WAS A WINNER! 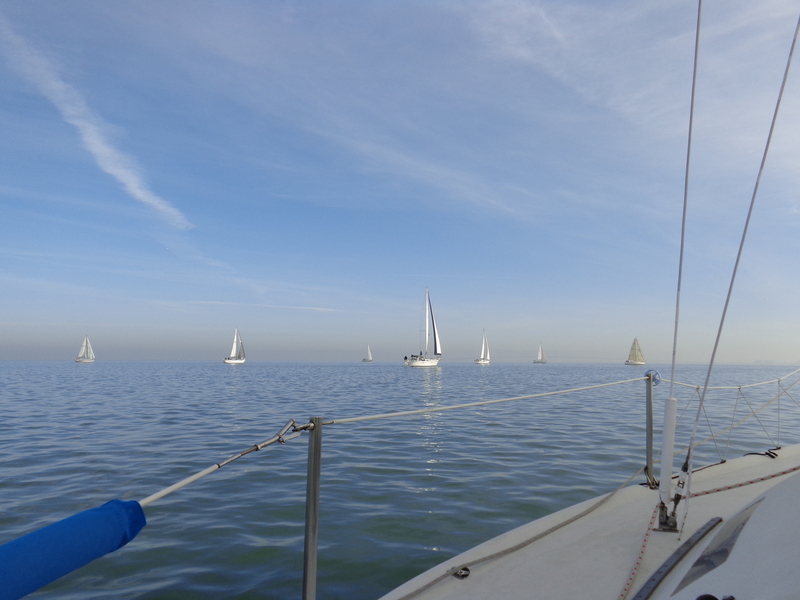 Tactical errors, or none, cluelessness or not, there were no losers in today’s glorious winter day on the water. I mean, really – how often do you get the opportunity to sail backwards? Slowly, most of the skippers (really, Jack?) buckled up their boats and headed up to the Club. What awaited them was a fabulous spread of snack food and a veritable cornucopia of accoutrements if one ordered a bloody mary (I was extremely partial to the Chipotle Cholula, cocktail shrimp and pickled okra). There was even a cameo appearance by Shorteez Regatta winner, Mark Canton, just flown back from Seattle after having given up racing for the day to spend extra time with his girlfriend (we do love Kate, though!). – and to my SSO Aaron, my ex-work-wife Kassondra and her boyfriend Chris on Liquid Kitty – what a lovely crew to spend the first day of the year bobbing around on the Bay with!